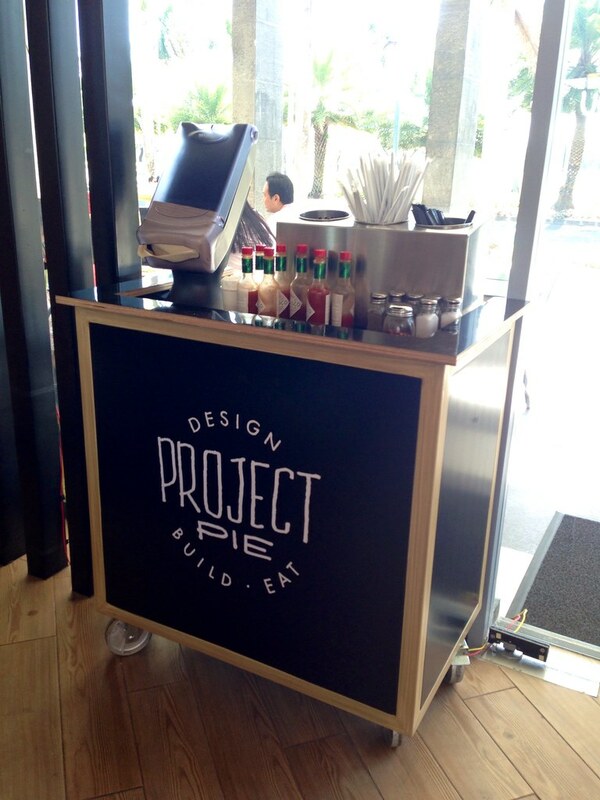 Project Pie Philippines: Design Build Eat Your Own Artisan Pizza. 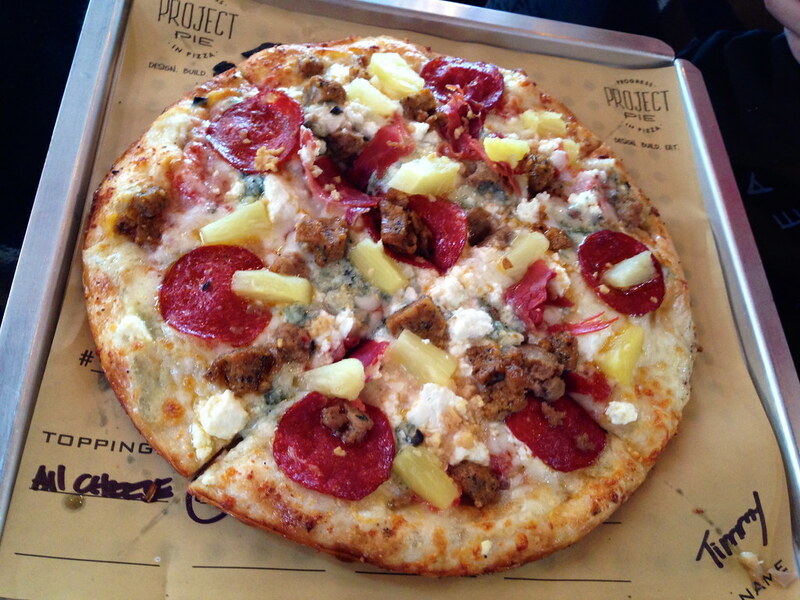 I first heard of Project Pie when it opened in Shaw. T and I love pizzas so we kept making plans but anything beyond Makati rarely happens for us (aka South people lazy to go out). 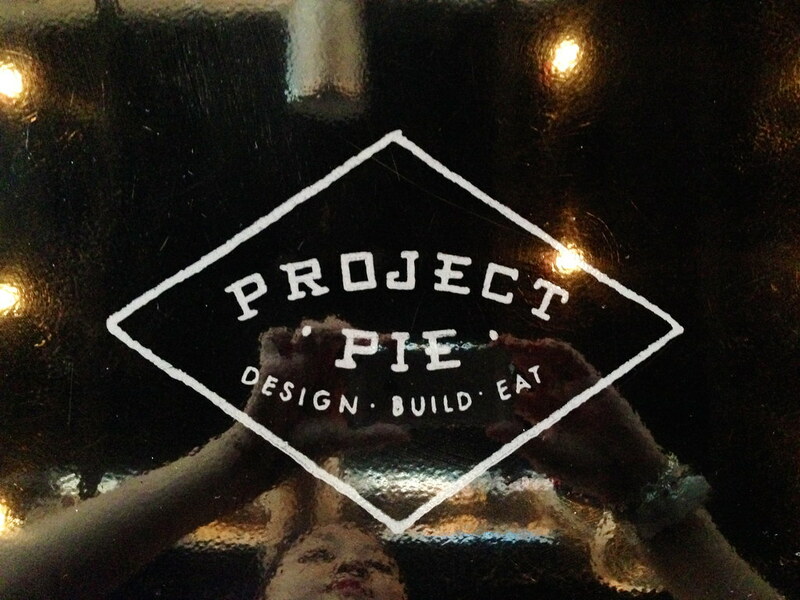 So when Project Pie opened in Macapagal and in Alabang, T and I went to both branches, pronto! There's a whole block being constructed along Macapagal Boulevard near Mall of Asia called Blue Bay Walk. 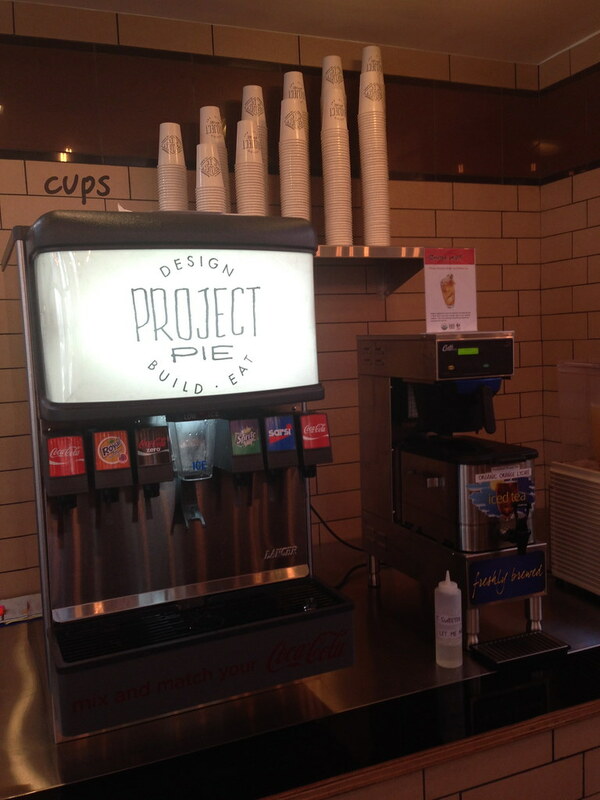 One of the first few establishments that's already operational is Project Pie. 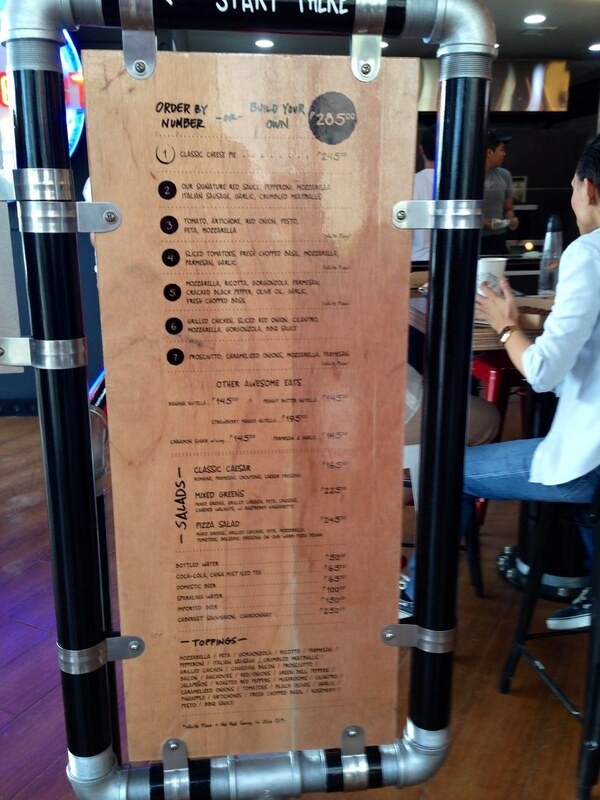 T and I were first timers, not knowing what to do as we entered, but this giant menu by the entrance was very helpful. 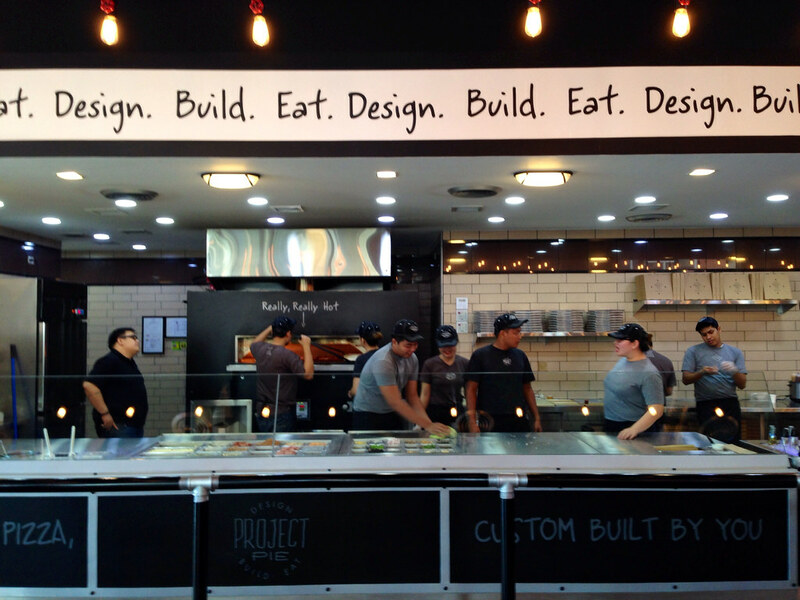 Basically, you get to design the pizza that you want. 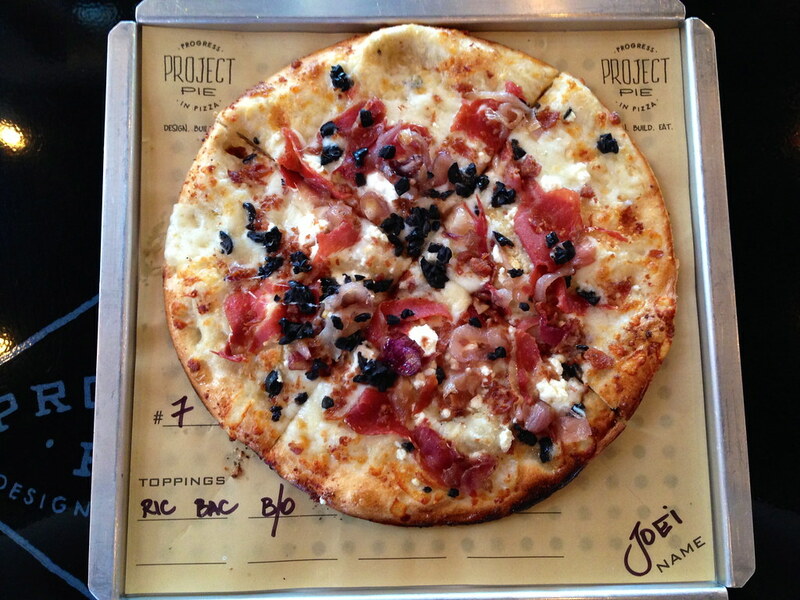 To help you out, Project Pie identifies seven popular combinations that you can use as a base. 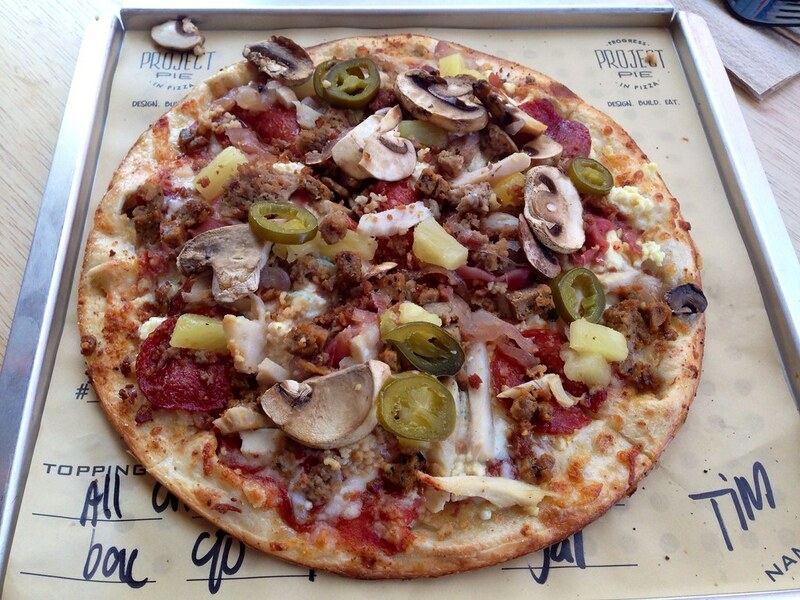 You can also add or remove toppings as you wish. There's an assembly line with different sections manned by different people. 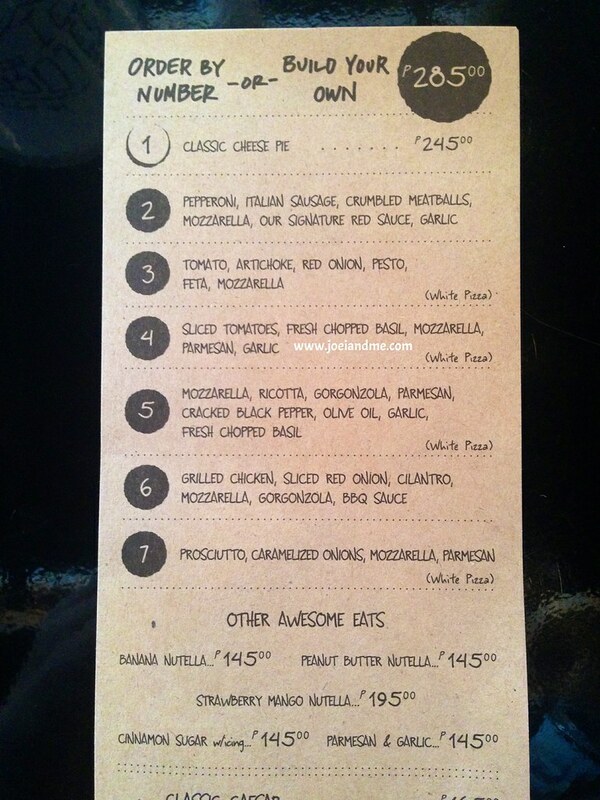 In the first section, you get asked what kind of pizza you want. T started with Pizza #2 while I started with Pizza #7. 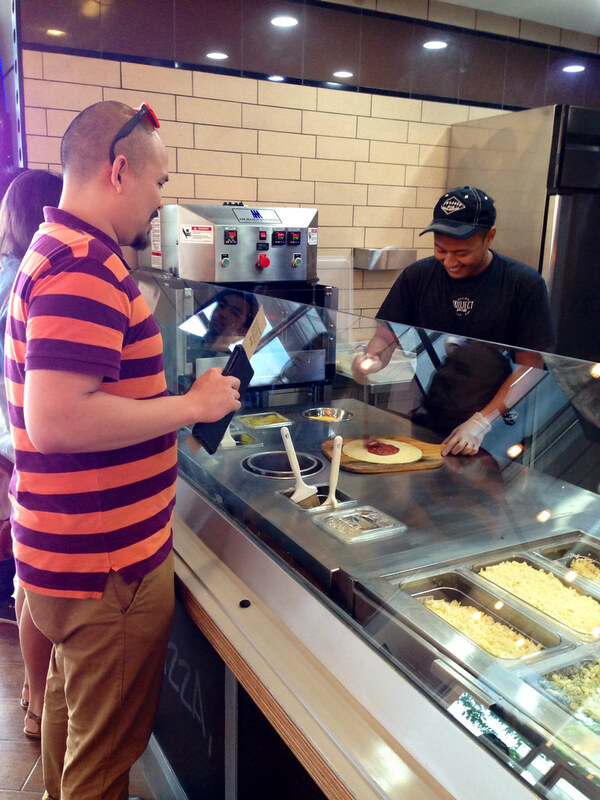 Then you get passed on to another person who will assist you with your cheese toppings. T had all kinds of cheese added to his pizza except feta while I just added ricotta to mine. 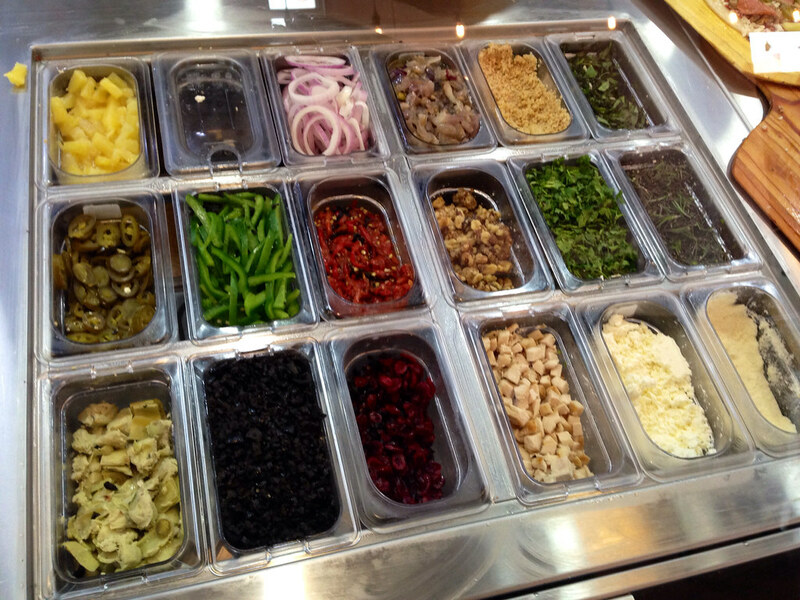 Then comes the rest of the toppings. T added a whole bunch of things to his while I only added bacon and black olives. 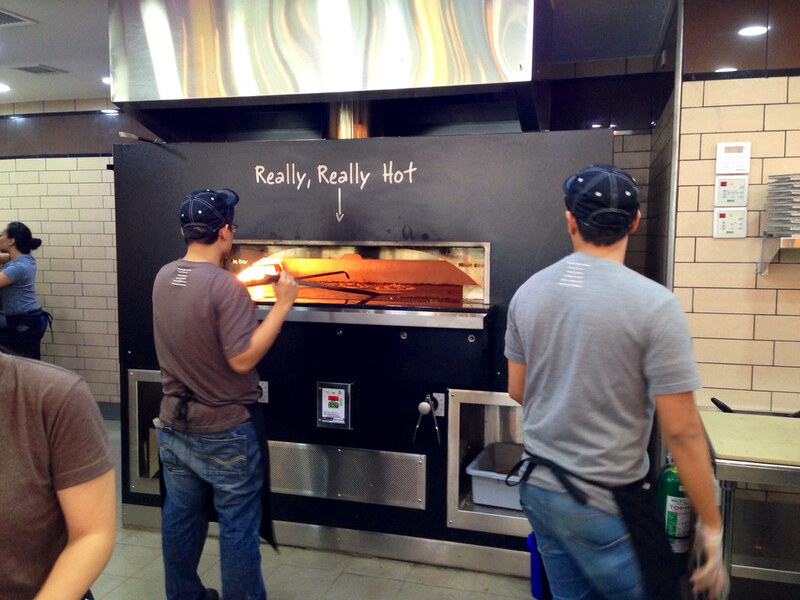 When you're done customizing your pizza, someone will place it in a big a$$ woodfire oven. While waiting, I looked around and saw these amusing "labels" on the wall. 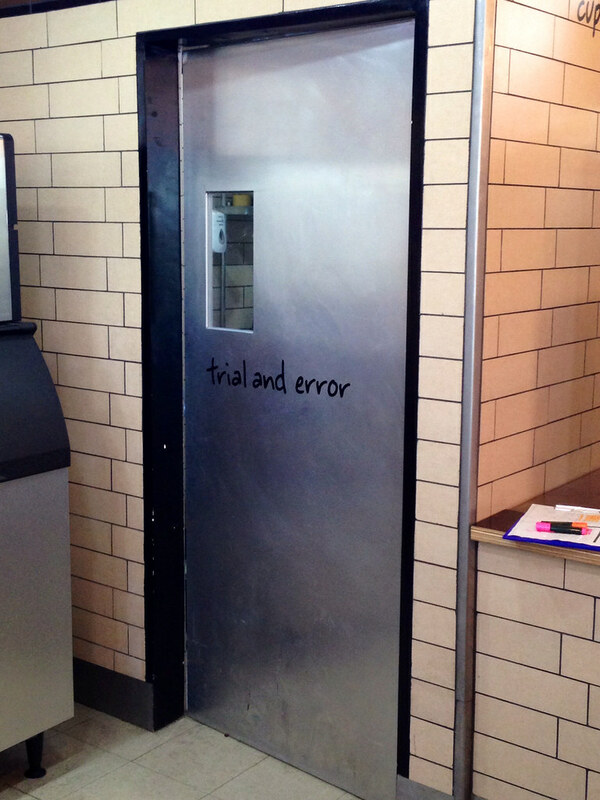 Care to guess where this door leads to? 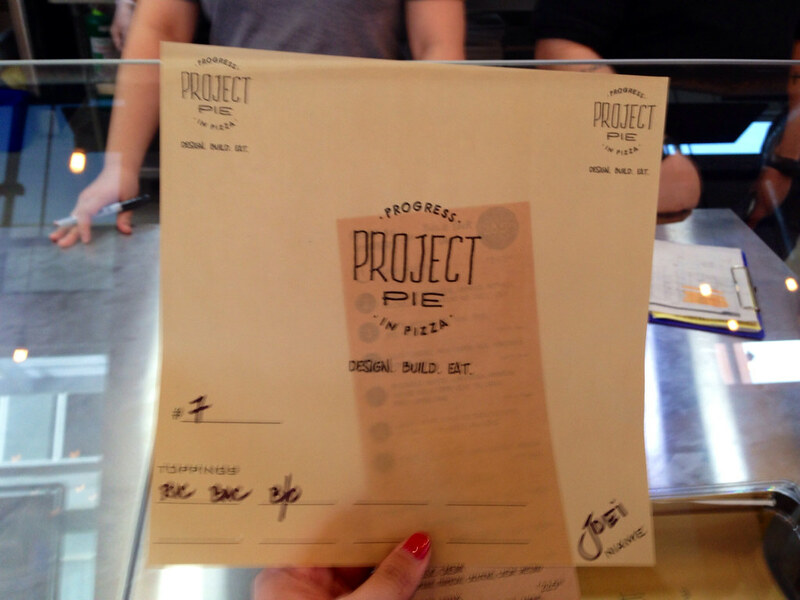 This sheet with your name and order will be placed under your pizza. 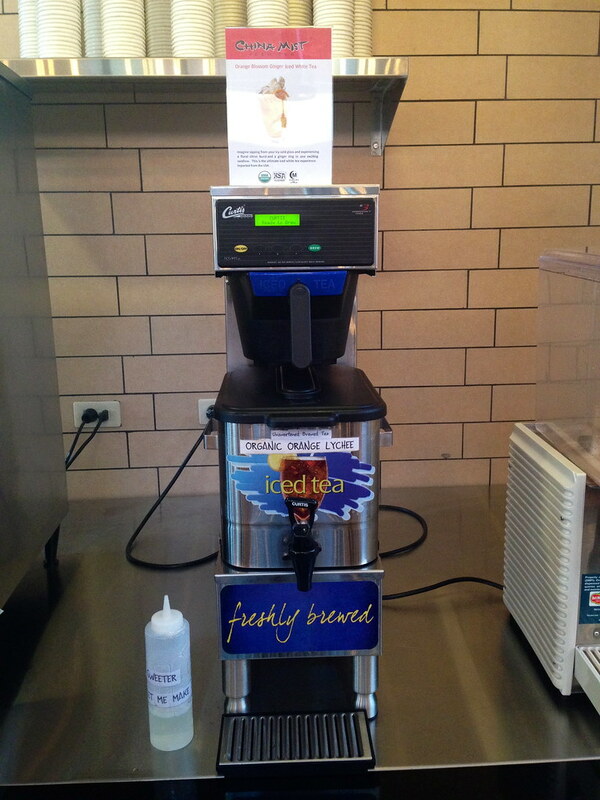 Or you can choose to get Bottomless Soda or Unsweetened Iced Tea (P65/$1.44), which T and I did. I just LOVE that they serve unsweetened iced tea and syrup on the side. Is there anything this place doesn't have? This is the seating area. T and I were lucky that there weren't much people yet. 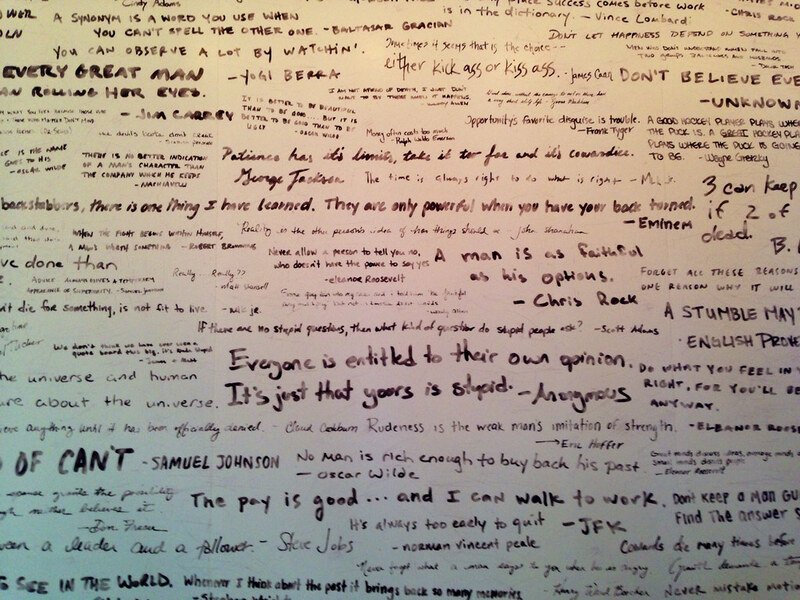 The quotes on the wall are amusing. 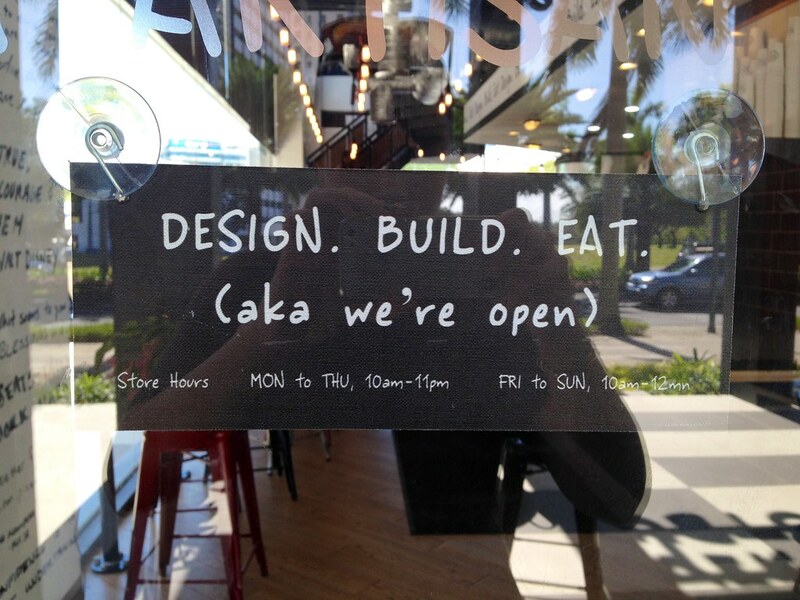 Some are serious but most are witty or even silly. Not long after, our names were called. 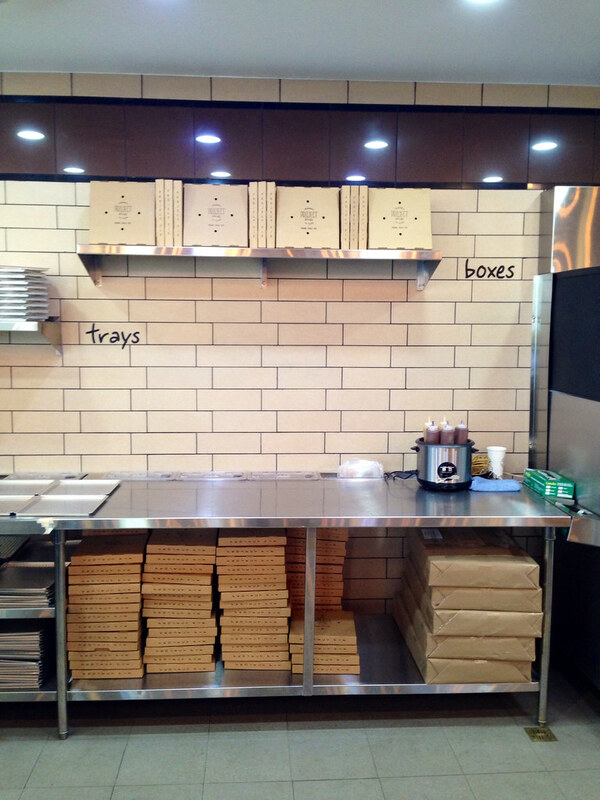 This is T's pizza. And this is my pizza. I was a little conservative with the toppings so it doesn't look as festive as T's. 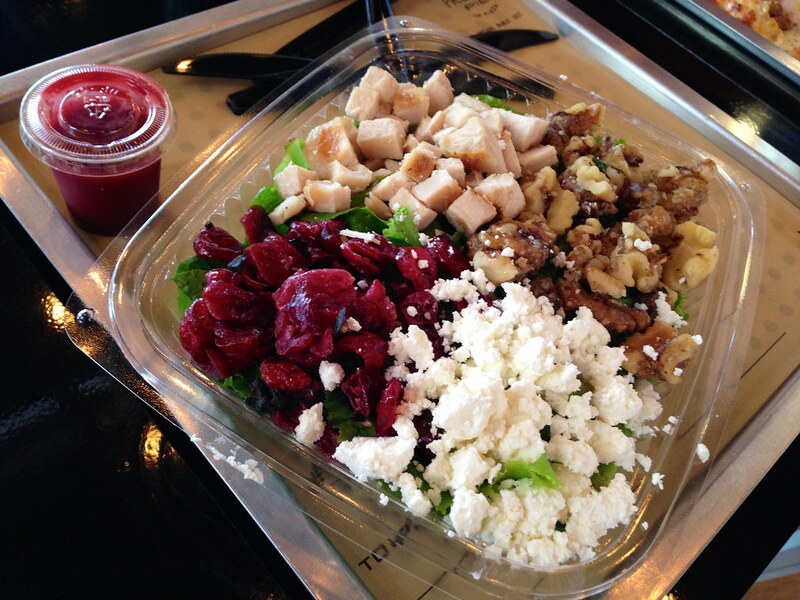 We also got the Mixed Greens Salad (P225/$5) which is mixed greens with grilled chicken, feta, craisins, candied walnuts and raspberry vinaigrette. Near the exit is the trash can so please clean as you go. 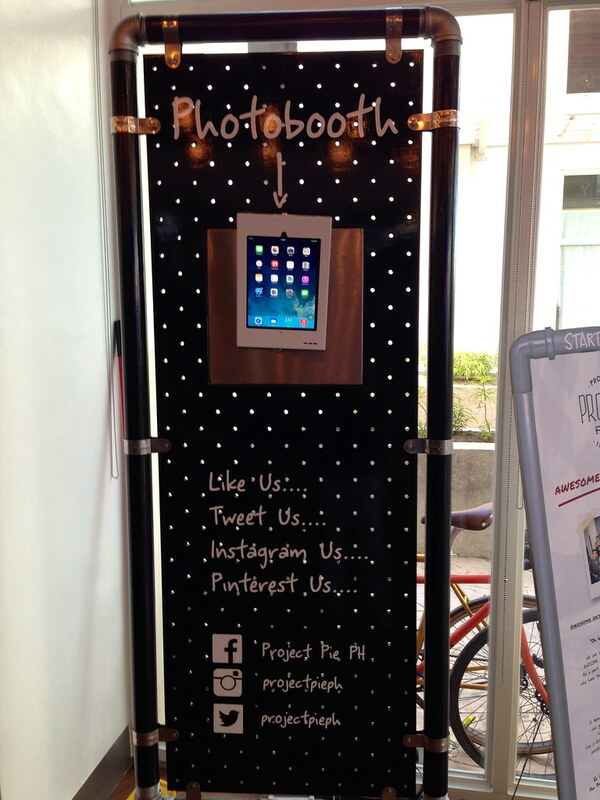 There's also a photobooth which Project Pie posts on its Instagram account. 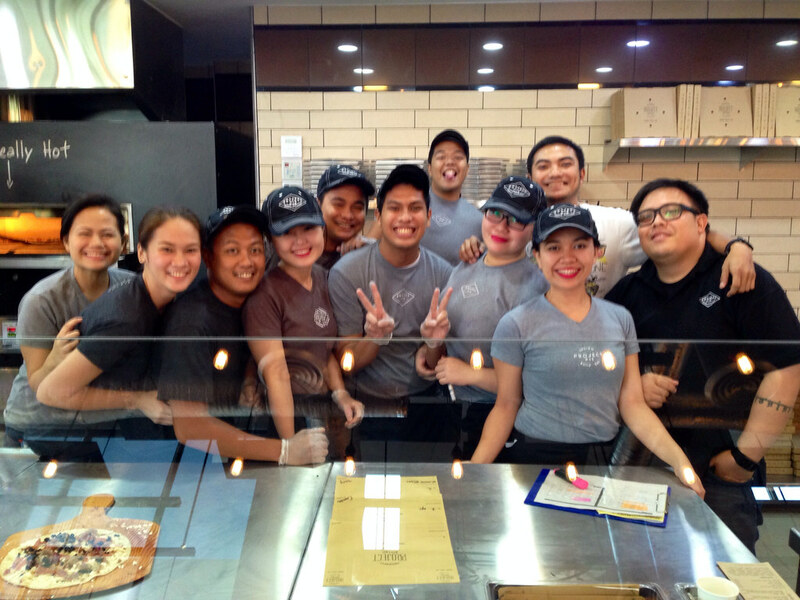 Thanks for making it a fun dining experience guys! 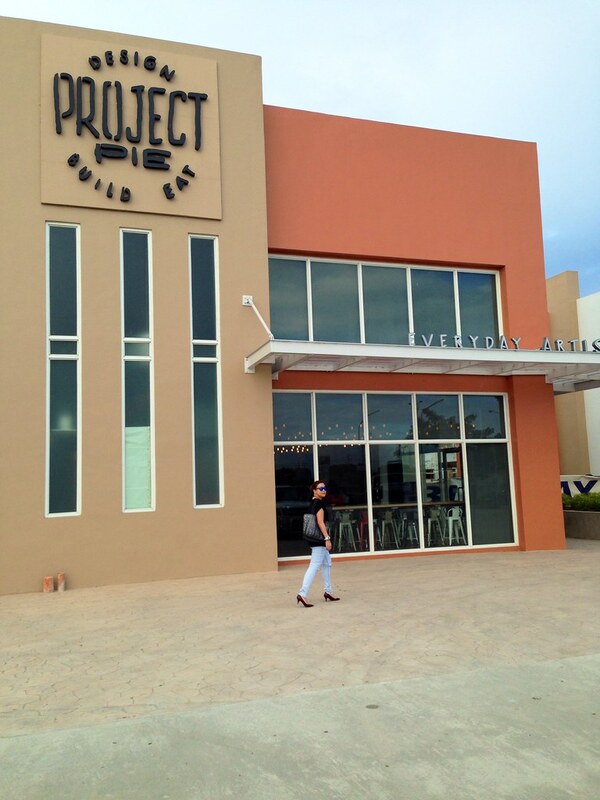 Funny, T and I went to Bluebay Walk Macapagal thinking the Alabang branch was still closed. 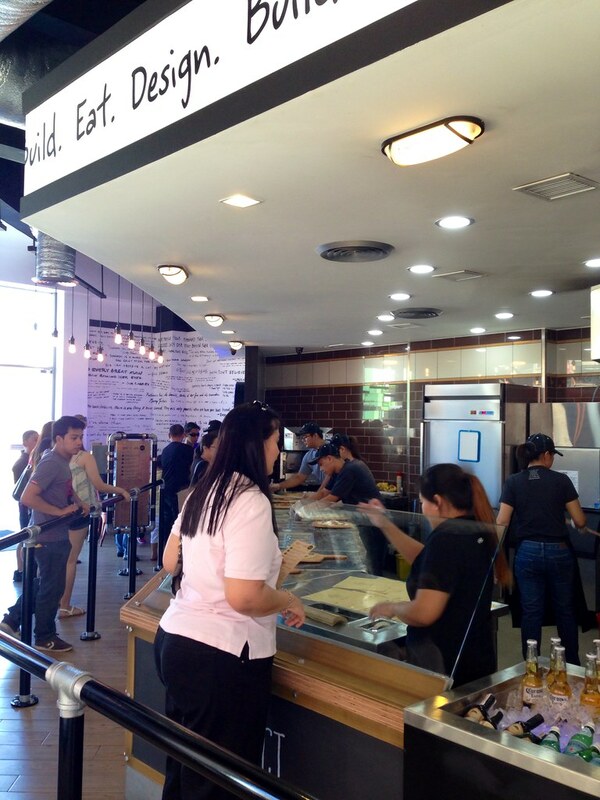 So when we asked the staff when their Alabang branch will open, we were surprised when they said, "Open na po." 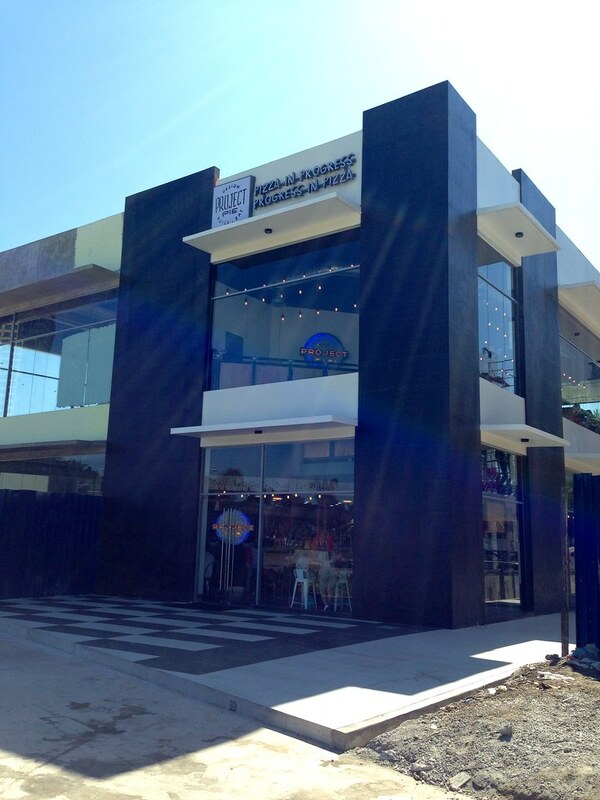 It's along Commerce Avenue beside Jollibee, which is still being constructed. The place was packed when we got there so I hurried to find a seat while T fell in line. It felt like I was back in our high school canteen with the saving-a-seat strategy. There's actually an upper floor but I didn't want to take any chances as the counter seats, where I was, were quickly being occupied. I like eating outdoor but it was pretty hot that day so that wasn't an option. 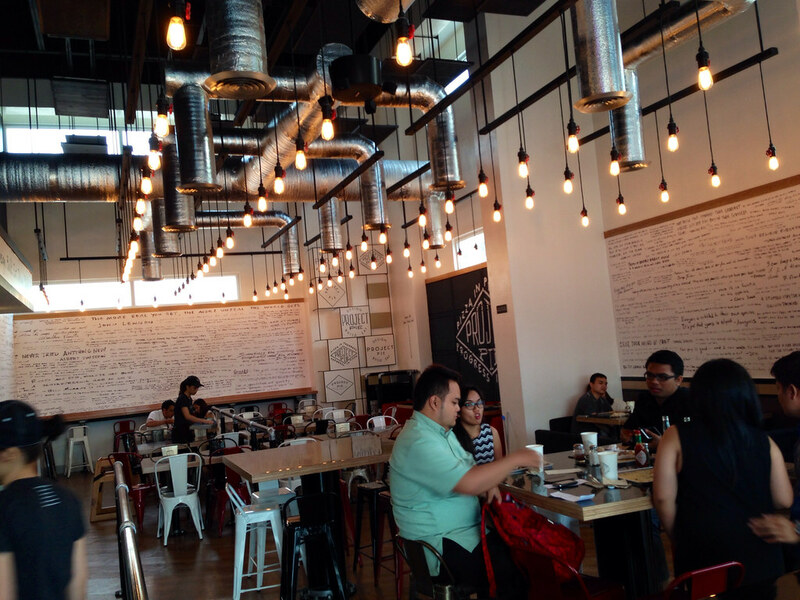 The kitchen set-up of Alabang is a bit smaller than Blue Bay Walk's. 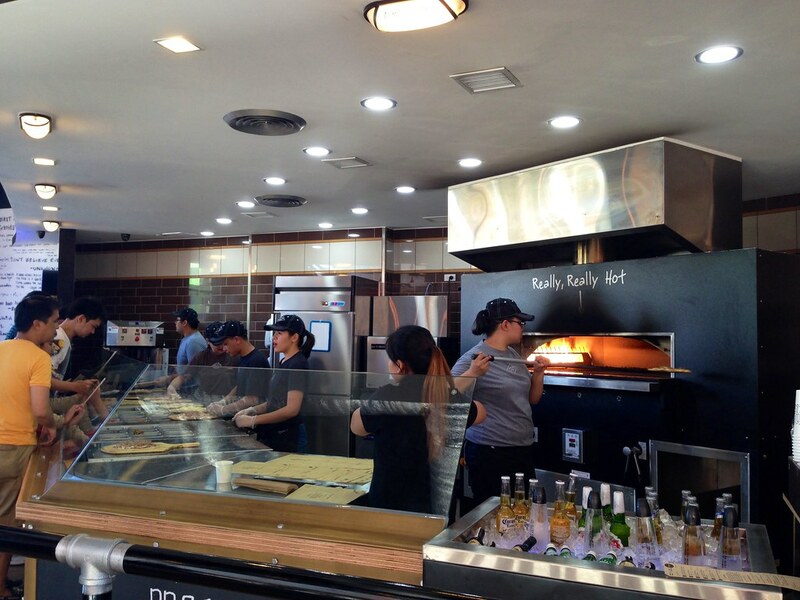 Can you spot the ice cold beers and wines? But it was too early that day so T and I just got bottomless iced teas again. 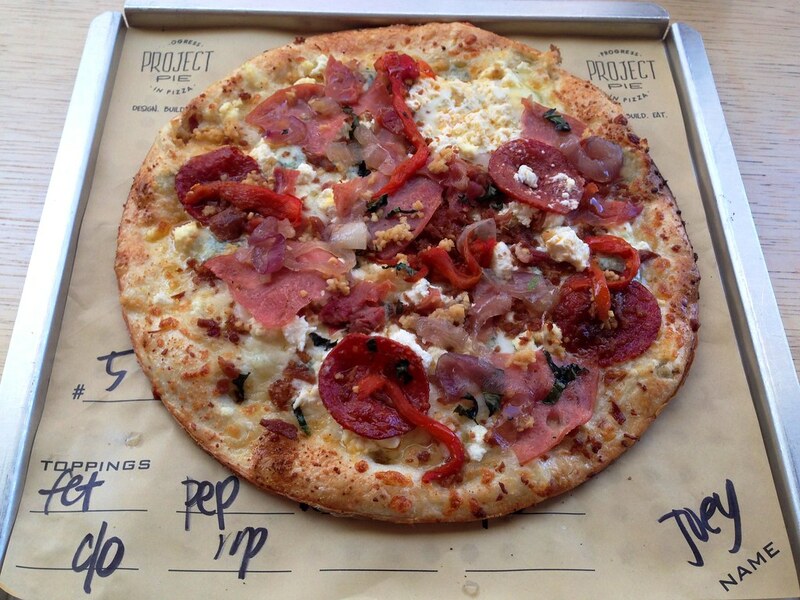 This time, I knew what I wanted so I just sent a text message to T, who was in line: Pizza # 5 with feta, parmesan, pepperoni, bacon, canadian bacon, prosciutto, caramelized onions and roasted bell peppers. Yeah! On the other hand, T got pizza #2 with grilled chicken, prosciutto, caramelized onions, fresh mushrooms, and pineapple. The condiments section is by the entrance and opposite the drinks section. Everything was so cramped! Plus, we expected the trash can to be in this area but it wasn't. We had to search for a few minutes before we found it in a corner, hidden among tables. I doubt it if people will clean as they go with this set up so I hope the trash can gets transferred to a more visible area. 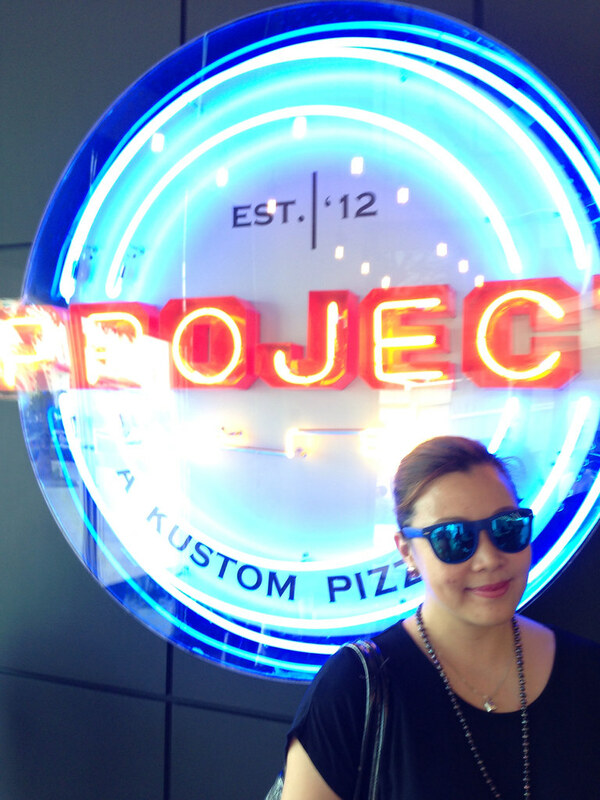 Here is Project Pie Alabang's operating hours. 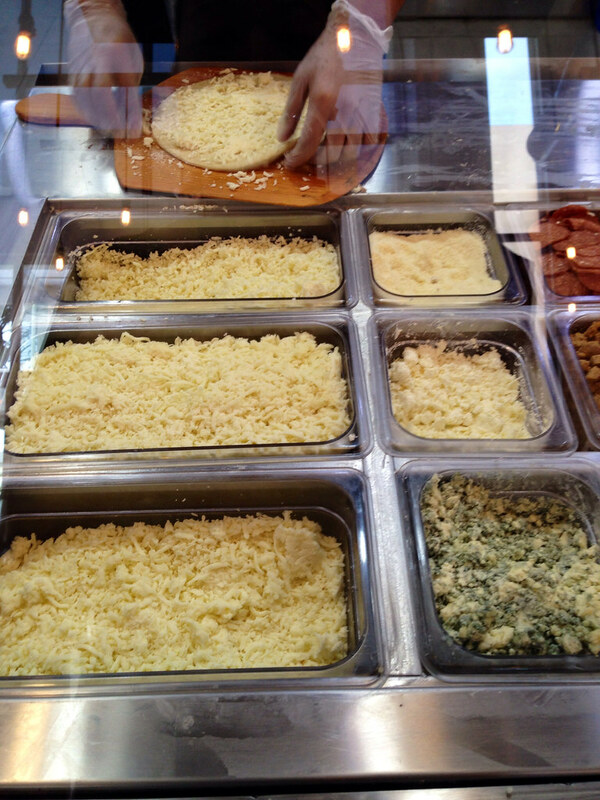 Good pizza with unlimited toppings. 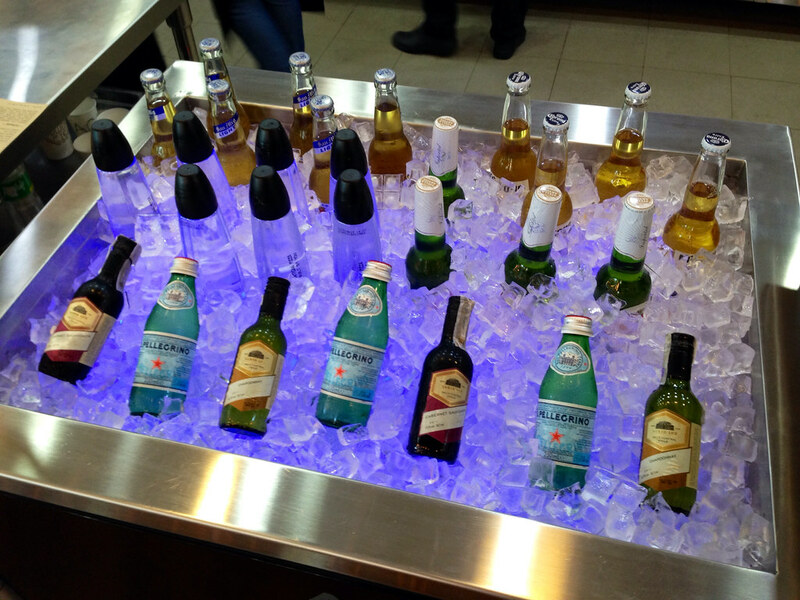 Serves imported beer and wine. 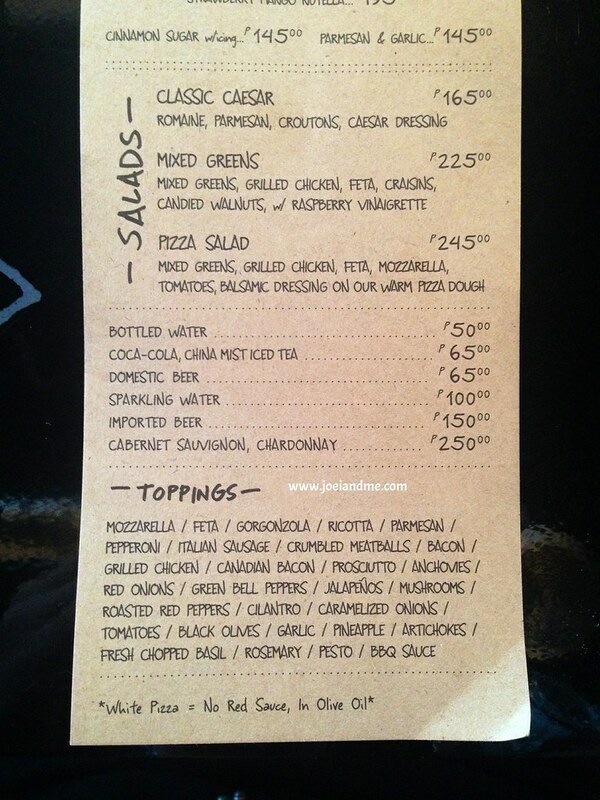 Serves bottomless drinks including unsweetened iced tea with syrup. 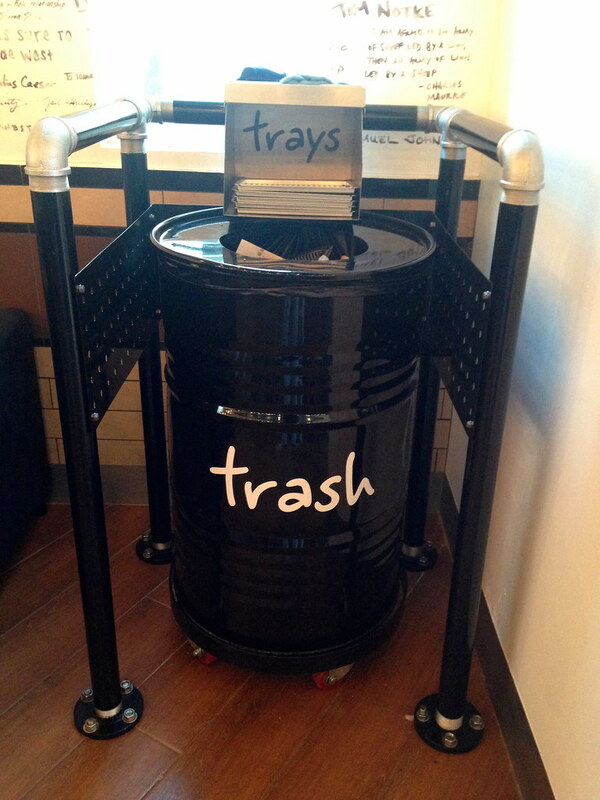 Trash can is visible by the entrance/exit so you know where to throw your trash. More organized lay out despite having only one floor. Uber friendly and enthusiastic staff. 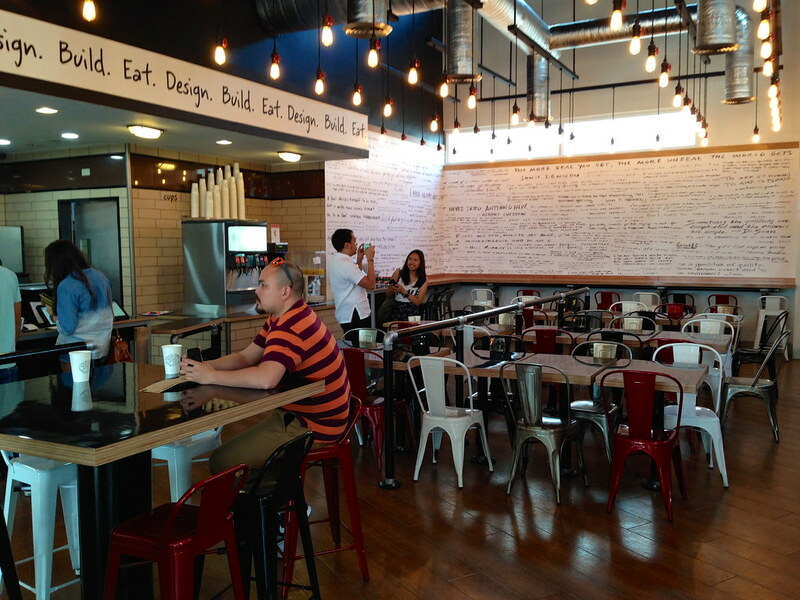 Has a nice outdoor seating area and a second floor. 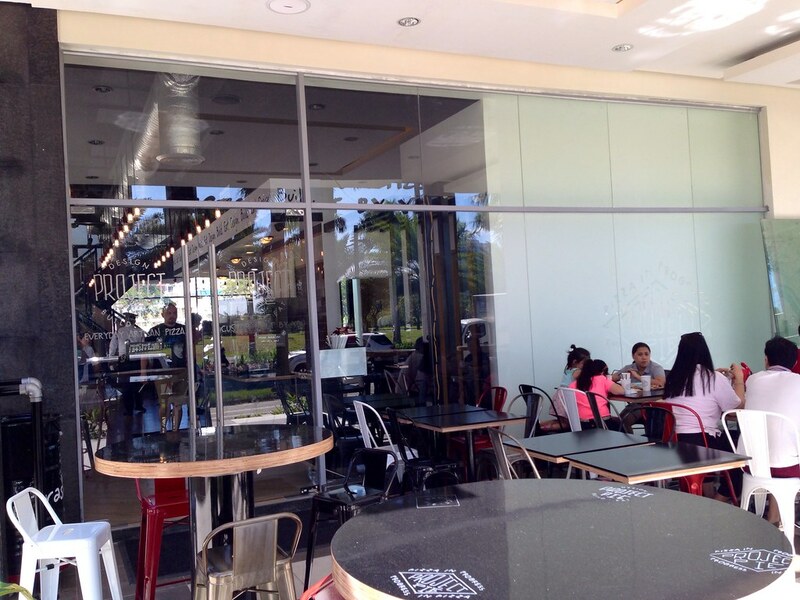 The canteen-style seating aka may mag sasave, may bibili. 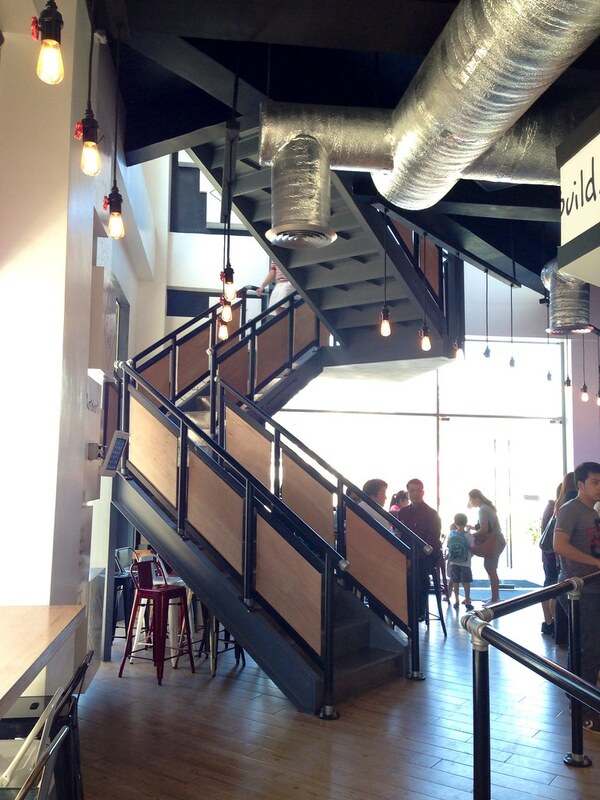 Although it has two floors and an outdoor seating area, the ground floor is a bit cramped. Trash can not visible unlike in Blue Bay Walk so people just leave their trash on the tables.